Over the past couple months, David and I have been working on redoing our kitchen and living room area to make the space feel more like us and reflect our style. Previously, there was an island in the kitchen which I really liked for the storage and counter space, but over time I realized it wasn't functioning well for us. We don't have a dining room, so when we had friends and family over for dinner we all were forced to cram around the island. When time came to rework the kitchen, I knew I wanted to replace the island with a table. I've always loved the look of a dining table in the kitchen because I think it gives the room such a cozy, inviting, casual feel. I had in mind exactly the kind of table I wanted - a distressed farmhouse table. I shared my idea with David, and thankfully he liked it and agreed to build one for me. The coolest thing about this table is the wood that we used for the top - it was salvaged from David's old band room! A couple years ago they were remodeling the floor and decided to remove the risers. The risers were framed with this beautiful cedar and David was able to bring the wood home in exchange for his labor in helping to tear apart the old floor. The wood is full of character, but we decided to distress it just a little bit further and hit it randomly with a hammer and some chains (which turned out to be a lot of fun!). When we put the polyurethane on top to seal the wood, it brought out the imperfections that much more and really enhanced the character of the wood. For the legs and support beams, we painted them white then distressed them a bit using sandpaper along the edges and other places that would normally show wear over time. I'm really thrilled with how it turned out and now I love my kitchen so much more. We are big fans of old farmhouses, but our house is new construction so we are working on adding in elements of the farmhouse style. This table totally fits the bill! Since we already had the wood for the table top and supports, we only had to buy four legs which cost us $60. We had the polyurethane and paint on hand as well, so the legs were the only thing we had to shell out some money for. I've seen tables like this sell for well over $300, so I was more than happy it only set us back $60. Especially when the table means more since we worked on it together and it has a personal history. We plan to make a bench with the same wood used on the table top for extra seating as well. We had some family over last weekend for a birthday party, and the new table worked out really well. We just need to get going on that bench so we have some more seating! really nicely done! and a matching bench would indeed be awesome! Great job with the table. Nice to see you were able to recycle that nice old wood. Wow, it turned out beautiful! That is an absolutely beautiful table. One I would love to have a meal at! Nice! I agree with the counter top issues, I'm ready to say goodbye to mine. OMG it is SO beautiful!! You guys did a great job! I love the chairs you put with it too- it looks perfect in your kitchen with that rug. Someday I'd love for my hubby to make me a farmhouse table too, either for outside or a casual indoor dining area. Your husband did a wonderful job on the table and it looks GREAT!! So much history before he made it and now a family heirloom!! Your kitchen is now the center place and work place - that you can enjoy!! Great job - your new table looks awesome in your kitchen!! That table looks just perfect there ...and kitty agrees ! 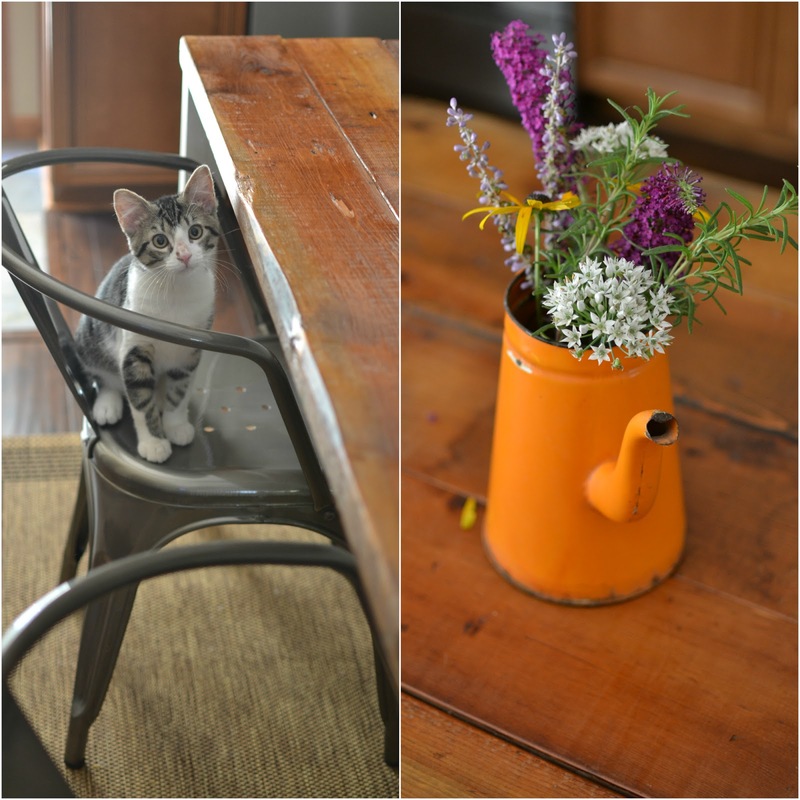 This is the perfect farmhouse touch for your kitcen! I LOVE THIS TABLE....just joking...I don't like it....so, could you sell it to me? ;) You have the best taste and those flowers? Perfect too! Beautiful! I love the two tone and the distressing, perfect addition to your kitchen! I love your farmhouse table....Me and my hubby are getting ready to do a 10 ft long one for our dining room. We want to be able to seat everyone all around the table. We have been pricing different woods...we want to do one like yours....just longer.... Its beautiful....Enjoy! Blessings! Wow, I just love the table! That's amazing that you built it yourselves! Great job! The table is so beautiful and well made. I love salvaged timber, so much character and tell a story. Oh my OH would love you. He is desperately trying to convince me to let him make a garden table from reclaimed wood. Thing is I know his will not look as nice as yours. I love your table and the chairs Tammy. Well done you two! Nice job, it looks great in your kitchen! The thought of fall being just around the corner must be putting the idea of farmhouse tables in the air because I am also in the process of building one (with two benches) that I hope to have completed by this weekend. That is a beautiful table! Your table is just beautiful! I found a harvest table recently I wanted so badly but it cost an arm and two legs. Since I've been trying to find something else I could work with. You did a great job! I don't have room for one in my kitchen - but in my next house..............I am so going to have one of these!!! New to your blog - and am definitely now following! I ADORE this table!! Good job, you guys! Tammy, your table looks wonderful. It is great that you were able to use the salvaged wood. You and hubby did a great job! It looks like it was just made to be in your kitchen. A perfect fit. this is a lovely table. i love your kitchen in general. It's just beautiful! So glad to see someone else recycles what's available! Beautiful table! And it looks like Gizmo thinks so too! What a beautiful and special table! That wood is lovely. I have been looking for a table like this! Yours is gorgeous!! I LOVE your table! And the idea of a hammber and chains, too cute! A farmhouse table has been on my honeydo list for years! Great job!